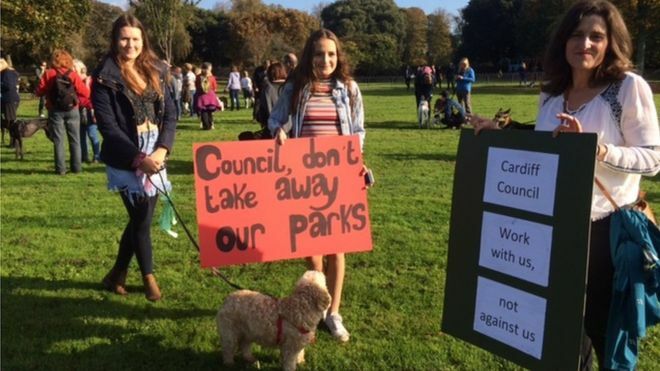 A controversial plan to ban dog walking on marked sports pitches in Cardiff looks set to be dropped. Furious dog owners responded with a petition of more than 16,000 signatures and a protest march by hundreds. Peter Bradbury, Cardiff council cabinet member for culture and leisure, said a blanket ban was now “highly unlikely” in view of the opposition. Dog owner Jeremy Sparkes said he was “delighted” there would be talks to combat dog fouling instead. Under the plan, people faced spot fines of £100 if caught breaking the ban on dog walking, with further penalties for any fouling by their pets. Mr Bradbury said the aim was to tackle a minority of anti-social dog owners, and claimed that the ban would only have affected 10% of green open spaces in the city, and only during the relevant sporting season. However, he added that there had been “such a groundswell of opinion that it’s highly unlikely we would be able to proceed on that basis”. “We will be talking to sports groups and dog walkers to find a way forward,” he said.